"In my days as a Commanding Officer of U. S. Coast Guard ships at sea, I developed a deeply held respect for the notion of preparing well so as to perform well. Chris Moschovitis challenges a new generation to embrace that philosophy." "The things you will learn in these pages will help you get ahead of the curve, become cyber resilient, and be prepared for the next time you ‘meet’ a hacker, who, unlike me, is not in retirement." "It is also, in all likelihood, the only book ever written (or ever to be written) about cybersecurity defense that is fun to read." Executive Director, National Center for the Middle Market, Co-author of "Woo, Wow, and Win: Service Design, Strategy, and the Art of Customer Delight"
"Cybersecurity Program Development for Business offers executives a rare look into the cybersecurity world in a pragmatic and jargon free manner… [It] could easily become the must-have for an executive's desk!" From understanding risk management to recognizing threats, from finding the right tools to delegating roles and responsibilities, this book walks the reader through each step of developing and implementing a cybersecurity program. “This is the book executives have been waiting for. It is clear: With deep expertise but in nontechnical language, it describes what cybersecurity risks are and the decisions executives need to make to address them. It is crisp: Quick and to the point, it doesn’t waste words and won’t waste your time. It is candid: There is no sure cybersecurity defense, and Chris Moschovitis doesn’t pretend there is; instead, he tells you how to understand your company’s risk and make smart business decisions about what you can mitigate and what you cannot. “In my days as a Commanding Officer of U. S. Coast Guard ships at sea, I developed a deeply held respect for the notion of preparing well so as to perform well. Chris Moschovitis challenges a new generation to embrace that philosophy. He encourages us to recognize how overwhelming the flood of guidance and advice can be to leaders in either business or government . especially when the topic seems more difficult to understand every day. Chris reaches backward into his own experience and lessons learned to design a practical approach to protecting the things for which those leaders are responsible. This book is not Cybersecurity for Dummies. Rather, it offers the insights and pathways important to those willing to do the hard work up front that will enable them to succeed when it counts. 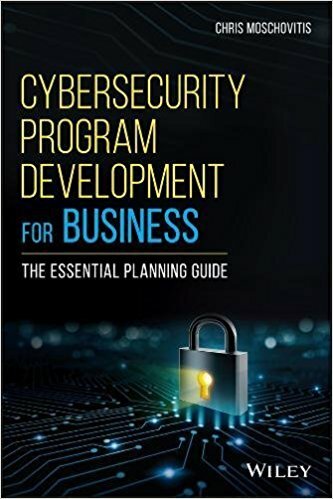 “Cybersecurity Program Development for Business by Chris Moschovitis is a great addition to any executive’s library of practical, how to books on a cutting edge (even bleeding edge) topic – how to secure your organization’s cyber resilience. Co-Author of “The Artificial Intelligence Imperative: A Practical Roadmap for Business” (Praeger 2018). A must-read book by an experienced practitioner and respected cyber security strategist. Chris Moschovitis provides an extraordinarily clear-eyed and concise perspective on the challenges of developing and executing cyber-security strategies in complex real-world environments. His deep understanding and keen insight create a valuable book that is both practical and actionable. Cyber-attacks have become ubiquitous; buy this book if you want to avoid becoming an easy target.